Live! From ESPN HQ and my mother’s basement! It’s the 2010 U.S. Men’s National Team World Cup Selection Show brought to you buy several large advertisers and this bacon and egg sandwich I just made for myself. Coach Bob Bradley is–in mere moments!–handing out 23 cherished tickets to South Africa and while the kleig lights lend the occasion a bit of pomp, the truth is there should be no surprises at this juncture. The only intrigue is the final two slots. Contenders are Edson Buddle and Herculez Gomez on the front line and midfielders Alejandro Bedoya and Robbie Rogers. Bradley could elect to take both strikers, but it’s unlikely that both Bedoya and Rogers make the team. It’s Bob Ley! The U.S. players are standing on a random field, looking uncomfortable and sweaty. Given. All three of our keepers are bald or balding. I’m glad I stopped playing goalie at 13, otherwise I might not have this magnificent head of hair. Who was the last goalkeeper with great hair? Schumacher? Higuita? Nothing crazy here, but for the continuing scourge of Bornstein. He’s like herpes. As mentioned in last night’s post, there’s a lot of versatility in this group should Gooch be physically unable to go (I spent a good half-hour last night trying to convince myself he was just rusty; didn’t take). Bocanegra can play in the middle or at left back. Spector has played right back from the U.S., but left back for West Ham (to middling results this past season). Maurice Edu is a capable centerback. And Jonathan Bornstein can go play in traffic. Bedoya out. That means an extra striker. Congrats Edson Buddle! I am Michael Bradley! I will not look at the camera! Most agree (and by “most,” I mean the people I brow-beat into agreeing with me) the U.S. is best served by starting Dempsey up top with Altidore and sliding Torres or Feilhaber or Holden into Deuce’s outside midfield slot. It gets your best players on the field. Of course, Dempsey has been most effective as a striker when moving there later in games, as opposed to starting there. And one also assumes he’ll see less of the ball on the forward line, a fact which has, in the past, caused his focus to wander. We’ll get a better line on Coach Bradley’s thinking after seeing the lineups for the next two friendlies. Wow! A stunner! Ching out and Robbie Findley in. I’m officially speechless. Taking four forwards likely means Dempsey in the midfield. To start. Alright boys. Get to work. England Coach Fabio Capello has named his provisional 30-man roster for the 2010 World Cup in South Africa. 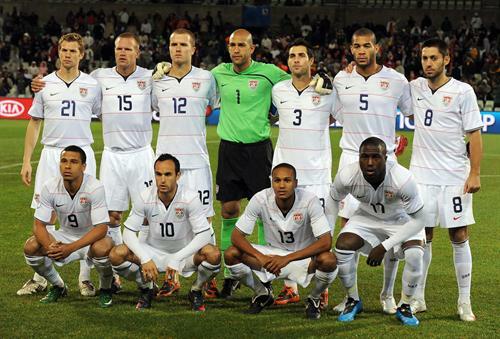 England will line up against the United States in their opening game on June 12 in Rustenberg. The most surprising inclusion is Liverpool defender Jamie Carragher, who “retired” from international duty in 2007. His recall may confirm that the only reason he ditched the national side is because previous gaffer Steve McClaren is a twit. Or Capello’s desperation–with the brittle nature of Rio Ferdinand and Ledley King–was enough to sway the Reds stalwart. Tottenham, who finished 4th in the Premier League and grabbed the last Champions League spot, place six players on the list, including Abbey Clancy’s boyfriend. Let’s hope Crouchie goes to SA for the crowd shots alone. U.S. Coach Bob Bradley is set to announce his provisional 30-man roster for South Africa tomorrow at 2 p.m. (Eastern), which gives me perfect opportunity to speculate which Americans might be on the list. That’s what blogs are for, yes? Let’s get right to the action. And done. Doubt a 4th GK will get called into camp. That’s 18. Lotta work still to do. Goodson has shown well in recent call-ups, so he has a leg up. Pearce is playing midfield in MLS, but is a Bradley favorite and and Marshall is just returning from injury. Everybody likes having Frankie around, but he’s showing his age recently and without pace his is nothing. Castillo is a long-shot due to his (lack of) size. A few months ago, as my friend Jorginho and I tried to pick a 23-man roster, I surprised him by including Beckerman. My thinking is this: both Bradley and Clark have shown themselves to be card prone, so if one of them gets a suspension, we’re left without cover in the middle of the park, so Beckerman needs to be included as a “destroyer,” since Coach Bradley is loathe to have a more offensive-minded player in the middle (ie Feilhaber). Beasley would be a useful option off the bench and Kljestan’s ties to Bradley Sr. make him a likely candidate and make me liable to puke in my mouth a little. Adu and Rogers are longshots thanks to poor form and middling results with the national team, but the inclusion of youngster Bedoya might surprise. Sigh. Not exactly awe-inspiring, is it? I expect a complete handful of these guys to get the call, considering the state of flux at the position. The final roster might include only three true forwards, but it’s a cattle call for now. Naturally, a healthy Charlie Davies is what we all hope for, but I personally believe the odds are pretty stacked against him. I’ll leave out Casey, Findley and Cooper on general principle (that principle being that they aren’t any good) and include the rest of the gang due to their recent goal-scoring form, although the only one about whom I can even generate the slightest excitement is EJ, who has been scoring recently in Greece and has previously shown to be dangerous when in form. That’s only 29. I’m sticking there, because there is no way I’m putting Robbie Findley on this roster.